As previously mentioned, I replaced the stock pipe with a DG, saving weight, improving performance and safety. The safety was from the louder pipe – people often hear motorcycles when they can’t see them, especially louder bikes. So here’s a before and after look at the pipe replacement, using video with sound. As it turns out, it’s not that much louder with the DG, but it’s a deeper, throatier sound. It is louder, but I didn’t want to rev it like I did in the stock pipe video and bother the neighbors (any more than usual). Bottom line: A good mod. Here’s the “before” of the stock pipe. Here’s the video of the DG pipe. Now it sounds like the thumper it’s supposed to be. 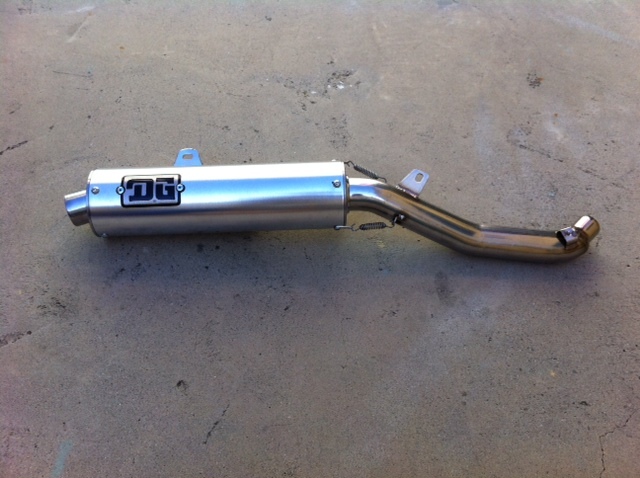 The DG replacement exhaust pipe arrived today. It was advertised as weight 5.5#, but it really weighs only 4.5#; I weighed it on two different scales. That’s about a 9# weight saving over stock (14.5#). New pipe to save weight, add power and noise.
. It also adds more power. And since it’s a performance pipe, the sound level goes up – everything says to 96-98 decibels, which is pretty loud. That’s a safety device. Cars and others will hear you, which helps because they always say they can’t see you. The downside is pulling in and out of home, restaurants and hotels, where you’re a big annoyance. Nonetheless, it sounds pretty cool. A skid plate is an essential mod for any serious off-roading. Crack your case on an unsuspecting rock and you’re stopping right there, no matter where there is. So no biggie, my first mod is the skid plate. But I read that on the DR650, the skid plate somehow echoes engine noise up to the rider. So I’m sound-proofing mine with spray-on rubber coating. I was going to use neoprene – glue it inside the whole plate – but it will gain weight after getting wet and rot over time. So the rubber coating seems better, but it’s also kind of thin. Anyhow, we’ll see. I still have lots of earplugs. And the 96db DG pipe that’s coming might drown everything else out anyhow.